New Flash season 3,episode 3 official spoilers,synopsis released by CW. Recently, CBS revealed the new,official synopsis/spoilers for their upcoming “The Flash” episode 3 of season 3, and it sounds like we’ll see some very interesting and highly dramatic stuff go down as the city gets terrorized by a meta human that has the ability to control metal! New Flash season 3,episode 2 official spoilers,synopsis released by CW. Recently,CW delivered the new,official synopsis/spoilers for their upcoming “The Flash” episode 2 of season 3, and it sounds like things will get very interesting and pretty intense as Barry finds out that the Flashpoint effects are way more impactful than he originally thought. In the new clip, we see a couple of new scenes with Barry trying to ask his father what year is it, since he’s been jumping through time a lot in this new Flashpoint storyline. Next, Barry is spotted revealing how he went back in time and created a whole new existence. We also see the rich Cisco of the altered time line, talking about there being a timeline out there where he’s not rich, and more. Flash season 3 bringing on Caitlin’s mother for action,new details. According to a recent report from Entertainment Weekly, The Flash season 3 peeps have hired actress, Susan Walters (left), to come on and portray Caitlin’s mother at some point. Her name will be Dr. Carla Tannhauser, and she’d described as being a world class biomedical engineer and CEO of a major research company. Caitlin and her mother will have a “long, difficult relationship, with Caitlin finding her mother cold and withholding, and Carla regarding her daughter as rebellious and ungrateful.” Wow, so it sounds like we may see a few sparks fly between these two. It was actually revealed in season 2, that both Caitlin and her Earth 2 doppleganger, Killer Frost, didn’t feel all that great about their mothers. Caitlin’s mother is set to possibly be a recurring character. New Flash season 3 spoiler scoops delivered by the cast & TV Line,new clip. Recently, the Flash season 3 cast and producers hit up the big 2016 Comic-Con event in San Diego,CA to serve up new spoiler teasers with TV Line’s Michael Ausiello (video below). It turns out that we’re going to see a very new dynamic between Barry and Joe’s characters with the new Flashpoint storyline in effect. Barry and Iris move things to a new level, and more. In the new clip, they said they tried to stick as close to the comic book version of the big Flashpoint storyline as possible, but they did add their own spin to it. The Flashpoint storyline is going to cause the Joe and Barry dynamic to be completely different. Tom Felton from all those Harry Potter flicks, talked about working with his new Flash cast, and said it was really fun, and that it kind of reminded him of the Harry Potter set. New Flash season 3 first spoiler trailer clip released. The Flash season 3 crew showed up at the big 2016 Comic-Con event in San Diego,CA this weekend, and they served up a new spoiler trailer clip (below) for their upcoming season 3. It looks quite intense and very interesting as Barry finds himself in a new, very altered reality due to him deciding to save his mother from getting killed, and more! In the clip, they show Barry interacting with the new Flashpoint reality that is in effect after saving his mother from getting killed back in time. Barry is spotted seeing both his parents alive in the supposed, new present day. New Flash season 3 promo pic shows new Kid Flash character in action. According to a new report from the TV Line peeps, The Flash season 3 folks are turning Wally West into a new character called Kid Flash! Apparently, the new “Flashpoint” storyline that they’ve got going on in which Barry chose to save his mother’s life back in time, triggers an alternate timeline. And in this new timeline, Barry is no longer The Flash, but Wally West is! We don’t know how they will actually play out the Flashpoint storyline on the show. However, we do know that Wally West will be suiting up as Kid Flash at some point. 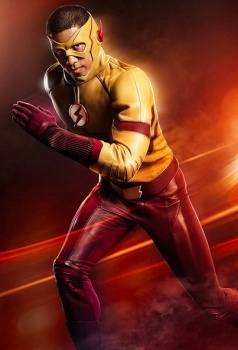 They’ve also released a new promo photo (above) of Wally West, played by actor Keiynan Lonsdale, all dressed up in the Kid Flash outfit. Flash season 3 cast to reveal a lot of new spoilers this month. Hey, “The Flash” peeps. We’re reporting to you that it’s that time of the year again. The Flash cast and crew peeps are all set to head back to the big Comic-Con Summer event out in San Diego,CA later this month to deliver their very informative Question & Answer session for their upcoming season 3. The cast is scheduled to deliver their panel session in Ballroom 20 on Saturday evening, July 23rd, 2016 in the 5pm pacific standard time slot. Currently, the official announcement of the cast that will be on hand, hasn’t been revealed yet. However, we can confidently guess that the main stars: Grant Gustin, Danielle Panabaker, Candice Patton, Tom Cavanagh, Caros Valdes and Jesse L. Martin, along with some of the executive producers will show up. The session is scheduled to be about an hour along, and we’re sure that it will deliver a lot of new insight into what we can expect to see in the new season 3. Flash season 3 bringIng on new CSI guy for series regular action,new details. According to a new report from the TV Line folks, it has been revealed that the Flash season 3 folks have hired the former Harry Potter, Malfoy dude, Tom Felton, to come on and play a new CSI guy that will be a series regular on the show. Along with all those freaking Harry Potter flicks, Tom Felton has appeared in “Rise Of The Planet Of The Apes,” “Get Him To The Greek, ” “The Apparition,” and a lot of TV stuff, so he’s pretty seasoned at this point. Tom is set to make his Julian Dorn debut in the early parts of season 3. No specific episode was given, but definitely be on the lookout for him early on.